As the dust settled on the 2011-2012 school-year, reading specialist Jeri Powers met with a team of teachers to reflect on the experience of implementing the “Read. Write. 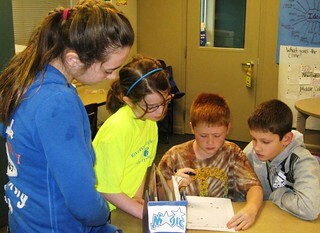 Share!” project with the fifth grade class. She asked the team what stood out about the experience. What had surprised them? The teachers shared that the students who had not displayed academic potential prior to the project rose to the top, enabling them to see real areas of strengths in kids who had typically struggled-- strengths that had previously gone untapped. “Read. Write. Share!” was a yearlong project designed to engage and motivate students to read and write in more meaningful ways. Spurred by 2008 Kansas Teacher of the Year Jeri Powers, the entire 5th grade teaching team at Riverview Elementary collaborated on this effort. The idea was simple: throughout the year teachers would use a wikispace as a platform for proposing authentic challenges to students, while encouraging 21st century literacy skills. Over the course of the year, students would use the space to solve challenges in a variety of formats including podcasts, video PSAs and documentaries, and animations. The first “Read. Write. Share!” challenge was inspired by a Social Studies unit on colonization. Students had options to explore this 300 year-old piece of American history from a variety of angles. Would they consider the challenges of living in the Colonial Era, or would they consider our country’s most recent “colonists” by investigating immigration within their own community? 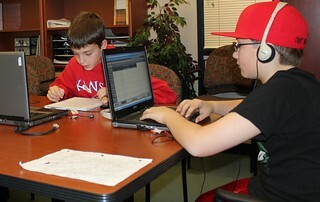 Once they made their decision, students worked together to write, edit, produce and publish podcasts. Students Ally and Katie present a story about a family separated during the French Indian War. Olivia, Josie, and Chloe interviewed a young man who immigrated to the United States from Russia where he lived in a foster home. As the year went on, students had more flexibility in the media used to solve challenges. This approach created "expert" students who helped each other, creating an atmosphere of support and excitement about learning. Inherent in this environment was a focus on encouraging students to be risk-takers, to persist when new learning is difficult or unclear, and to understand the value of learning through trial and error. As the teacher team sat together reflecting at the end of the school-year, they realized that the learning opportunity had not just been for their students. They, too, had grown. The use of digital media and student-directed projects had forced them to relinquish control, allowing kids to problem solve along with them and become the experts. As everyone problem-solved together, each student- and each teacher- found a way to contribute. Press from Read. Write. Share! Jeri attended the 2011 “Mission Possible” workshop at the Smithsonian EdLab in Washington, DC. In the summer of 2012 she returned with two teachers from her 5th grade team. This year Riverview Elementary is working with Model Classroom to implement a year-long school based professional development program. Stay tuned as the program kicks off in mid-November!